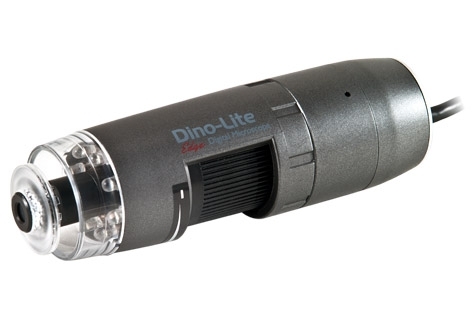 The Dino-Lite AM4515T8 Edge series handheld microscope features high magnification (700x~900x), improved optics for sharper images, and Automatic Magnification Reading (AMR) for easy measurement. This model also features a greater working distance at high magnification, which provides more clearance between the microscope lens and the object under view. With these features, this microscope will excel in biomedical research, material analysis, electronics inspection, or any similar applications that require the examination and measurement of intricate structures. The specialized software bundled with this product (DinoCapture 2.0) allows users to calibrate the microscope, capture & annotate images, measure image features, and record video. With the Automatic Magnification Reading (AMR) feature, measuring image features becomes as easy as point-and-click. Users are not bothered with manually reading and entering the magnification into the software before every measurement, which increases efficiency and reduces the potential for human error. This AM4515T8 also features a scroll lock on the magnification dial to secure the dial and fix the focus and magnification, which can be helpful to prevent unintentional rotations of the dial. Other standard features include the MicroTouch shutter button for quick and convenient picture taking and eight high-intensity white LEDs that fully illuminate the viewing subject. The AM4515T8 can be used on its own as a handheld device or secured in place with a microscope stand. For tabletop usage, the Dino-Lite RK-10 universal stand is the best choice for this model, due to its precision controls and sturdy design, which make it a stable viewing platform at high magnifications. To learn more, visit the RK-10 product information page under the Accessories product category on this website.